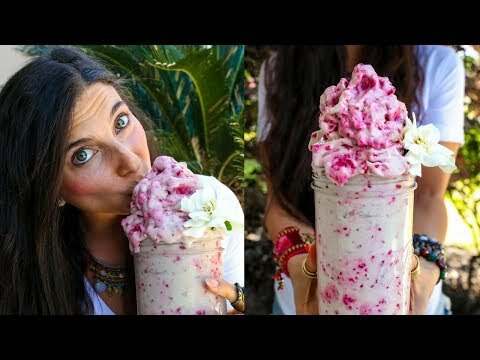 ﻿ DIY Raw Vegan Ice Cream! Raspberry Vanilla Coconut Whip! 1 Cup of Raspberries (Frozen or Fresh), blended and separated in another bowl. 5-6 frozen bananas blended with 1 scoop of sunwarrior. 1 large scoop of thick coconut milk (I call it coconut whip). Blend together and place in a bowl. Mix in the raspberries until it creates a cool swirl! Scoop your ice cream into a jar or bowl and enjoy!